President of Ukraine Petro Poroshenko has met with U.S. Undersecretary of State for Political Affairs David Hale noting a significant strengthening of the Ukrainian-U.S. strategic partnership over the past four years, including a significant increase in security and defense cooperation, as well as active growth in trade and economic cooperation. "Further joint steps on countering Russia's aggressive actions in the Black and Azov Seas, as well as measures in response to the Russian armed attack on Ukrainian ships were separately discussed. The need to further increase pressure on Russia, including through sanctions in response to aggressive policies, was noted. 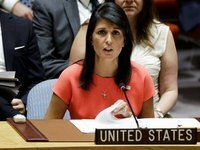 The need for further strengthening of pressure on Russia, including through sanctions in response to the Kremlin's aggressive policy, which purposefully undermines international stability and security, was noted," the press service of the Ukrainian President reported on Thursday morning. In addition, the President of Ukraine and the Under Secretary of State discussed the issue of elections in Ukraine. "They emphasized the need to prevent external interference in the democratic electoral process and preserve internal stability in the country," it said. Poroshenko emphasized the important role of the U.S. assistance for successful implementation of reforms and strengthening of the defense capability of Ukraine, which continues to move towards European and Euro-Atlantic integration. The Under Secretary of State conveyed congratulations from U.S. Secretary of State Mike Pompeo, noted a "significant progress Ukraine has made in recent years in the face of Russian aggression" and assured the President of Ukraine of the continued support by the United States of America. As reported, the U.S. Embassy in Ukraine said on Twitter on March 6 that Ukrainian President Petro Poroshenko and United States Under Secretary of State for Political Affairs David Hale discussed prospects for the release of Ukrainian sailors and boats seized by the Russian Federation. "U.S. & European partners stand with Ukraine against Russian aggression. Russia must return Ukraine's sailors & ships and all illegally jailed political prisoners. Under Secretary Hale communicated these messages and more in his meeting with President Poroshenko," the U.S. Embassy in Ukraine said on Twitter on Wednesday.